Where Should We Start When Grass Abounds? If you're fishing cover exactly what are you fishing? Cover is anything which is situated "upon" the bottom of a lake or river but is not "part of" the actual structure of the bottom. This includes natural cover like aquatic vegetation (that's grass and weeds for all us Bass Bums™), the numero uno type of bass attracting cover. But it also includes wood in the form of stumps, logs, laydowns and submerged timber. Docks are a form of cover too. Also included are many types of man made cover that finds its way to the bottom intentionally or unintentionally. The intentional kind could be Christmas trees, concrete culverts and old cars. The unintentional type might be deck chairs blown into the lake by the wind or sunken bass boats, ouch! Why is cover important for bass fishermen and fisherwomen (can't forget the ladies you know)? Because it offers a source of shade and retreat from which bass can ambush their prey and, more importantly in the case of grass/weeds, a place where their prey lives and thrives. As I said in the page on fishing structure, cover + structure + deep water close by, is the formula for success in bass fishing. Finding and fishing cover when it's part of this complete equation is almost a guarantee you will catch bass. By far, the best cover is that found in the form of weeds and grass. Hydrilla, milfoil, coontail, lily pads and curlyleaf pondweed are some of the more prevalent and offer some of the best opportunities for fishing cover. If you're fishing cover you better be fishing grass. 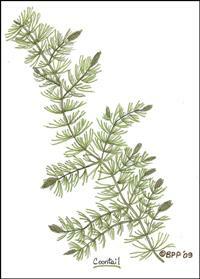 Milfoil, aka myriophyllum spicatum, is an non-native invasive plant that is the bain of pleasure boaters and seen as a gift from God by bass fishermen. This weed grows in water that is 3-12´ feet deep and is a largemouth bass magnet of the highest order and a smallmouth magnet if in a lake where largemouth aren't the dominant species. Milfoil can get out of control and become an infestation and then it's to much of a good thing. 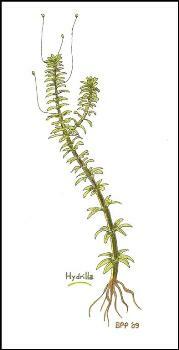 Hydrilla, aka hydrilla verticillata, is another bad exotic. Like milfoill, it's also an invasive non-native. 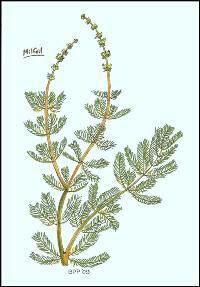 It can grow and mat in 20´ of water and really aggravates pleasure boaters. The image to the right is but "one" stem. In lakes these often grow so dense they're jammed together tighter than a can of sardines. Both of these species are capable of forming a surface mat that can be 2-3´ thick, though the stems below this are virtually without leaves due to lack of sunlight. This canopy creates shade and cooler temperature for bass in summer. It also provides a place from which to ambush prey which is often abundant within the grass jungle. Fishing cover like hydrilla and milfoil should be a priority because both are bass magnets. These weeds filter the water of sediment helping with water clarity, provide habitat not only for bass but the different forage upon which bass depend for survival and produce oxygen through photosynthesis which attracts bass. However, when either species reaches the point of an "infestation" it is capable of doing more harm than good, completely overwhelming native plants and upsetting the natural balance of the lake's ecosystem. It can serve as a great habitat for mosquitoes, interfere with power generation on impoundments and though grass produces oxygen in the area in which it's located, it can also cause a reduction in oxygen in deeper water by preventing the mixing of water by wind. Beyond all this, when fishing cover like grass, it creates conditions difficult to fish. Not only is finding bass in such a matted jungle tough, but getting lures to them is as well. I'm OK with milfoil and hydrilla interfering with pleasure boaters and jet ski maniacs but when it starts to interfere with bass fishing then it's time to call in the cavalry, wildlife resources and the local university, for a little herbicide control. There is much we as anglers can also do to help control the spread of these exotic invaders but that's another issue for another page. Two natives that we often find in our lakes are coontail and lily pads. Coontail, aka ceratophyllum demersum, is a native. It provides great habitat for micro and macro invertebrates which are in turn great food for bass. When fishing cover don't pass up any opportunities you have to fish coontail. Fish it wherever you find it! 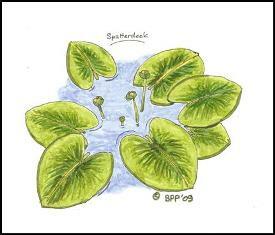 Lily Pads, the two most common being "fragrant water lily" (white lily) and "cow lily" (spatterdock), provide very good habitat for amphibians, reptiles and other micro and macro invertebrates. Surprise, surprise, bass love lily pads too. Wonder why? Lily pads are sometimes called "slop" and have the reputation of holding large bass. Anytime you find them they're well worth fishing though you'll likely find more bass in matted fields of milfoil or hydrilla. When fishing cover like lily pads remember that bass will move well back under the canopy so make long casts with lures like frogs, spinnerbaits and swim jigs. Bass will use weeds throughout the seasons to one extent or the other. In early spring in bays and along shorelines they will use the inside edge where it's shallow for spawning. They will also use this area as an edge with which to corner prey. Shiners and bluegill use this area to spawn as well so the bass are naturally attracted to it to feed. After this they will move to the outside edge where there is a change in depth to 10-15´. As summer progresses they will roam the points and turns of the outside grass edge (weedline) hunting food or lurk in the shadows around "open", weed free spots (pockets) in the grass ready to ambush any hapless shiner or bluegill. As fall approaches and the grass begins to die and recede bass will move away from he deeper edges and into the more shallow areas to begin "feeding up" for winter. "Uh Oh! Look at all that grass!" All of us have at one time or another looked hopelessly at an expanse of of vegetation without the slightest idea about where to begin fishing it. How do we find bass in this mess and pull them out of these grass jungles? Remember edges? That's where you start when fishing cover like grass. Structure has edges, so does grass, only different. You will find inside edges, outside edges, holes and depressions with 180° edges as well as "points" in grass. You have to fish grass like you fish structure, only different. Uh? Bass will locate in grass on the edges and around its pockets. The edges, depressions and open spots (pockets) of grass usually reflect changes of bottom depth or composition beneath the grass. Edges on edges. Now it just doesn't get any better than that! So start with the outside edge. First use a spinnerbait or crankbait to draw out any active bass that are hunting prey along the weedline. Next go on top with a frog, weedless spoon or even a floating worm pulled across the mat. Make numerous casts and pause briefly when you get to any open pockets in the mat. Remember, bass use the inside edges of these pockets as ambush points. Finally, go in with a tube or worm on a semi-heavy Texas rig targeting pockets. Fishing cover like thick grass can be effectively done with a technique called "punching the mat". It's vertical jigging up close and personal. You begin by positioning yourself right at the weedline, almost on top of the target you've identified but certainly no more than 6-7´ away. Because the mat cover so restricts the ability of a bass to see anything above it you can approach quite close without spooking them. Furthermore, since the light under the mat is dim, bass don't have the time to closely inspect a lure passing through or over the mat and may instinctively strike anything that gives a reasonable impression of food. 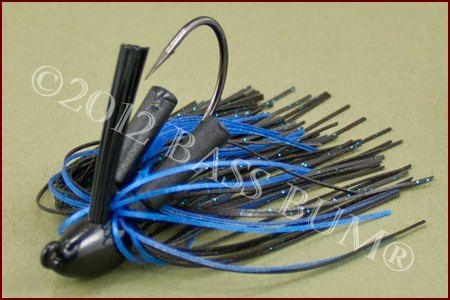 Use a bullet shaped jig and try to get away with the lightest jig you can though a 5/8oz to 1oz is most practical. Place a large trailer on it so the fall is slowed drastically. Flip the jig into your target pocket keeping your line as vertical as possible while feeding line on a controlled fall. If you're not "bit" on the fall lift and drop the lure in place briefly before retrieving it to flip into another opening. Check out the page on fishing jigs for more jig fishing techniques. Visit drop-shot technique and dropshot rig to learn more about how to drop-shot in grass. Though there are many ways to fish a drop-shot rig using it to fish grass is a relatively new approach which puts the lure directly under the mat and right in the face of bass. Bass hanging just under the mat canopy are often very aggressive. (1) Concentrate on the "edges", the weedline. And on the weedline focus on the irregularities. Use crankbaits and spinnerbaits to entice bass who are patrolling the edge for prey. (2) Fish the "end" of an edge as this usually indicates a change in bottom composition which draws bass in search of prey fish. (3) When fishing lily pads consider using live shiners. Bass tend to travel far back under the canopy of lily pads and shiners will venture there looking for a place to hide. Guess who is waiting? Of course frogs on top are a great choice. (4) If the weed field is very dense on top then "punch the mat" with jigs as described above. (5) Don't overlook inside edges in summer after bass have moved to deeper water. They will still return to use inside edges to find prey as bluegill and shiners will remain there in abundance. Buzzbaits and lipless crankbaits are good here. (6) Seek out weed clumps that are set apart from a large weed field like is found with with curly pondweed and coontail. These are great bass attractors. (7) Look for "humps" within grass fields where the grass tops are below the surface. These will be areas where the grass is closer to the surface than the surrounding grass. (8) Work pockets with surface lures, floating worms and swim jigs. Make a long cast then work your lure across the surface of the grass or lilypads stopping at pockets. Let you lure sit on or slowly sink in the opening. Yes, when you're fishing grass you're fishing cover, "quality cover" with the potential for big bass. But there are other types of cover that hold bass as well.